Jiffy Padded Mailers are rugged, all-purpose, paper fiber, cushioned mailers and made from a high percentage of recycled material so they are 100 percent curbside recyclable. Heavy-duty kraft with a uniform inner batting (padding) provides excellent cushioning protection. Double-folded corners and double-glued bottom flap afford additional edge protection and overall bag strength. 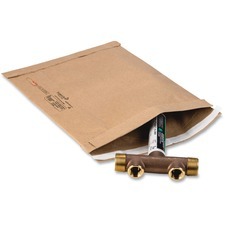 The 9-1/2" x 14-1/2" mailers are easy to use. The smooth inner liner and pre-scored flap allow easy product insertion and a more efficient closure. Use the convenient self-seal closure to seal in the contents. Convenient tear tape allows simple, fast opening. Natural kraft provides excellent surface for custom printing. 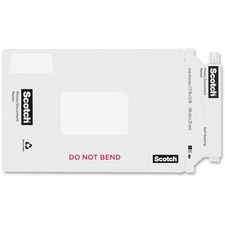 Scotch Photo/Document Mailers provide effective cardboard protection for documents, photographs and digital media such as CDs and DVDs. Feature self-sealing closures with tear strips for easy opening. Include a bold "Do Not Bend" statement in bright red print and special coating for extra writability. 100 percent recyclable. 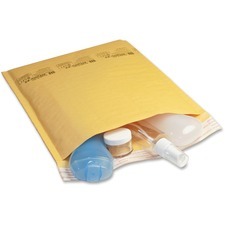 Cushioned mailers protect contents and reduce expenses with a lightweight design for postage savings. Fully laminated bubble cushioning provides stiffness and puncture-resistance. Seamless bottom affords additional cushioning protection along with greater overall strength and safety. Fasten the mailer with a self-seal closure for added convenience. Strong, outer material is ideal for custom printing and made with a high percentage of recycled material. 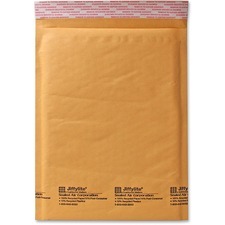 Air cellular cushioned mailers have outstanding shipping protection for a wide range of semi-fragile, low-profile items. Bubble wrap material provides maximum air retention and cushioning power. Lightweight design saves you money when shipping. Seamless bottom affords additional cushioning protection along with greater overall strength and safety. Fully laminated kraft and air cellular construction provide outstanding stiffness and puncture-resistance. Padded mailers are rugged, all-purpose, paper fiber, cushioned mailers and made from a high percentage of recycled material so they are 100 percent curbside recyclable. Heavy-duty kraft with a uniform inner batting (padding) provides excellent cushioning protection. Double-folded corners and double-glued bottom flap afford additional edge protection and overall bag strength. Mailers are easy to use. The smooth inner liner and pre-scored flap allow easy product insertion and a more efficient closure with your own tape. Mailers are not gummed so they require staples or tape for closure. Convenient tear tape allows simple, fast opening. Natural kraft provides excellent surface for custom printing. 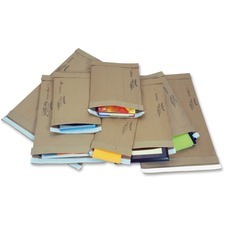 Mailers contain a high percentage of recycled material. Each mailer has a regular open-end design. Instant, flexible whiteboard solution allows you to easily transform painted drywall, glass, painted steel, finished wood or even old dry-erase and chalkboards into a dry-erase board. Easily install Post-it Super Sticky Dry-Erase Surface. It requires no tools. Simply unroll, peel and stick. Utilizing a proprietary dry-erase coating, this dry-erase surface is stainproof, erases cleanly every time and writes smoothly. Use anywhere from horizontal applications on desks or tables to vertical applications on surfaces where traditional whiteboards cannot be installed, such as windows. Cut to fit for endless possibilities for dry-erase solutions in new places. 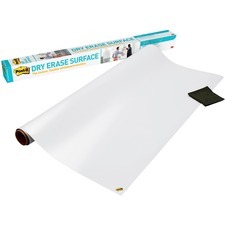 Post-it Super Sticky Dry Erase Surface is great for replacing old dry-erase surfaces that may be ghosted. Simply apply over the existing board, and it looks new again. 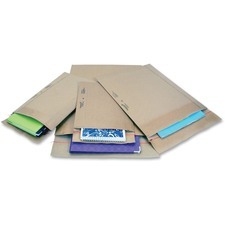 Padded mailers are rugged, all-purpose, paper fiber, cushioned mailers. They are made from heavy-duty kraft with a uniform inner batting (padding) that provides excellent cushioning protection. Double-folded corners and double-glued bottom flap afford additional edge protection and overall bag strength. Mailers are easy to use. The smooth inner liner and pre-scored flap allow easy product insertion and a more efficient closure with your own tape. Mailers are not gummed. Convenient tear tape allows simple, fast opening. Satin gold kraft provides excellent surface for custom printing. Mailers contain a high percentage of recycled material. Each mailer has a regular open-end design. Sturdy, commercial-grade fiberboard tubes are the ideal way to store or mail artwork, posters, maps, blueprints and anything else that cannot be folded. 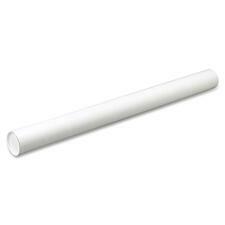 Mailing tube includes plastic endcaps. Fiberboard tube is covered with white Kraft paper. Usable dimensions are listed. Security mail bag is made of ballistic cordura nylon to provide maximum strength and durability. Padded handle, plastic bottom and tough armadillo trim ensure comfortable, long-lasting use. 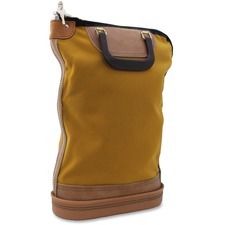 Water-repellent bag features a zipper closure with a pop-up lock and two keys to keep your items secure.